Club moorings are for the use of club members, and member's guests (when not in conflict with another member). Mooring fees are charged to users of the moorings to offset the operating costs of the moorings. Mooring fees are priced well below market and payment of the fees by users of the moorings is mandatory and expected. Please make use of the moorings and pay the fees. RULES: Club members may use the mooring on a first come basis. If you arrive and find a non-club member on the mooring, please ask the person to leave in a manner that will promote the goodwill of LHYC. Alternatively, you may wish to ask the visiting yacht to raft for the night. In all cases the rules and laws of the harbor must be respected. PAYMENT OF FEES: Fees are encouraged to be paid by Credit Card or PayPal account using the PayPal links located below. If this doesn't work for you, mail a check to the club treasurer at LHYC, PO Box 60, Huntington, NY 11743. Fees are due to be paid on the honor system promptly upon your return from your trip, however, there are no late fees charged and fees paid late are infinitely better than fees not paid at all. If you have any problems making a payment please notify the webmaster. South side of channel, towards the end of the mooring field. The square mooring float is marked "LHYC". For 2018 the loction is N 40° 54.706' - W 73° 26.479'. Use sound judgment when rafting multiple boats over night. 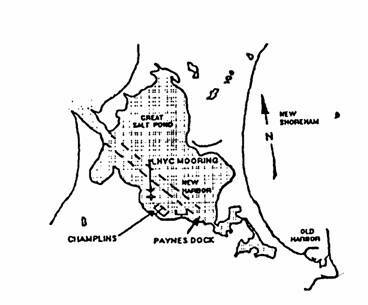 Northwest of Payne’s Dock on the south side of the channel: When entering Great Salt Pond, continue down the channel. The Mooring is in an area with other yacht clubs on the right side of the channel before Champlins. The mooring has a blue float with “LHYC” on it, (N 41°11.316’ W 71° 34.992’). If in doubt you can ask the Harbormaster when you pull in. Rafting up to three boats maximum is encouraged. – more will result in a visit from the harbormaster. The Harbormaster may ask for proof of club membership. This roster or the burgee is acceptable proof. $25.00 per yacht per night. The mooring ball has "LHYC" lettering. The Harbor Master restricts the mooring raft up to a maximum of three boats. $15.00 per yacht per night.